Laughing Salesman is basically a take on classic morality tales, mild modernized fairy tales which end poorly for the protagonist combined with "deal with the devil" story setups. Fair warning, it's not for everyone. Like many fairy tales, you may find yourself wondering who would be gullible or foolish enough to accept such a deal. But if you like schadenfreude, this may be for you. Beginning song and animation are both well done, with a catchy tune and animation showing salaryman drones/zombies as the main prey of Moguro Fukuzou, the laughing salesman; the laughing red mouth in particular evokes images reminiscent of the Rocky Horror Picture Show. Divided into two 15 minute segments, the main show itself relies heavily on 3D background animation combined with purposefully dumbed down looking protagonists, perhaps as a way of allowing the viewer to disassociate themselves somewhat from feeling too sorry for them. Stories use adult situations to depict their lessons, but nobody dies (at least in the first episode) and even lesson consequences themselves are tame enough for younger kids to watch, leaving one wondering who the target audience is. IMO, entertaining but a bit simple, and easy to guess where things are going as the story progresses, though again some will like this more than others. The Laughing Salesman is a dark comedy following titular salesman Moguro as he helps his clients pursue happiness. What he fails to specifically advise--although he does give cryptic warning about--is that happiness and joy are quite different, happiness being but fleeting. And when happiness is gone, the bill still remains to be paid. This series showcases some rather un-anime-looking animation, lending a bit of visual emphasis to its otherwise understated gallows humor. In premise and story, it's almost like you've stumbled onto the abandoned love child of The Twilight Zone and some noir James Cagney gangster film. Total bliss! In fact, the only reason that I gave this show four rather than five stars is that, once the terms of sale are set, the outcome becomes easily predictable--although no less fun to watch! A Dark Exploration of Greed. Disturbing antagonist, both visually and philosophically. All of the protagonists think they are getting something for nothing, only to discover the hidden cost of their debauchery. The main Antagonist, The Laughing Salesman, is visually disturbing and demonic in his actions. Luring people into things they can't afford. There's no love involved from my perspective. He puts people into situations that play upon their weak points, and then make them pay for their weakness in some awful way. I did not find this anime entertaining, in fact, it left me feeling somewhat hopeless and depressed. The animation was good, as was the voice acting. The plot is somewhat predictable but is new ground for an anime. But, I warn you, this anime won't make you happy unless you enjoy pleasure derived by someone from another person's misfortune (schadenfreude) as xeiran calls it. Want a break from mainstream anime? Give this one a shot. This show has nice animation which I didn't expect as the previous show was very old, so it's nice to see it newer and have something pleasing to look at even in 2017. It's still as messed up as ever, but the appeal of the show is that darkness because it teaches lessons and they sting more with this bit of edge attached. Try looking past the dark nature of this show, you may end up learning something. 1) They get turn off by the old school design. Sorry, the original manga was made in 1968, so yes it looks "strange". 2) This is created by Doraemon’s author trying to do something different. Love it or hate it you have to admit that he succeeded. This is an awesome classic from one of the most beloved Japanese authors. Everyone should give it a shot. Yes it is dark and sometimes depressing but that’s the point. Love it. Japanese animation at its best. The Laughing Salesman is a really good anime. The main protagonist is Moguro, an evil salesman that force people towards their vices. Often there is not even a real moral, just Moguro decides to ruin a person's life and manages to do it in a truly original way. Moguro's charisma and its way of doing are the true focus of this anime that always strikes for freshness and originality despite the episodes being all composed of two self-confident stories. A spectacular Opening / Ending and fun and original animations complete this artwork. Often, characters are also pushed to carry out actions that are contradictory with their promises, which makes the anime even more interesting. 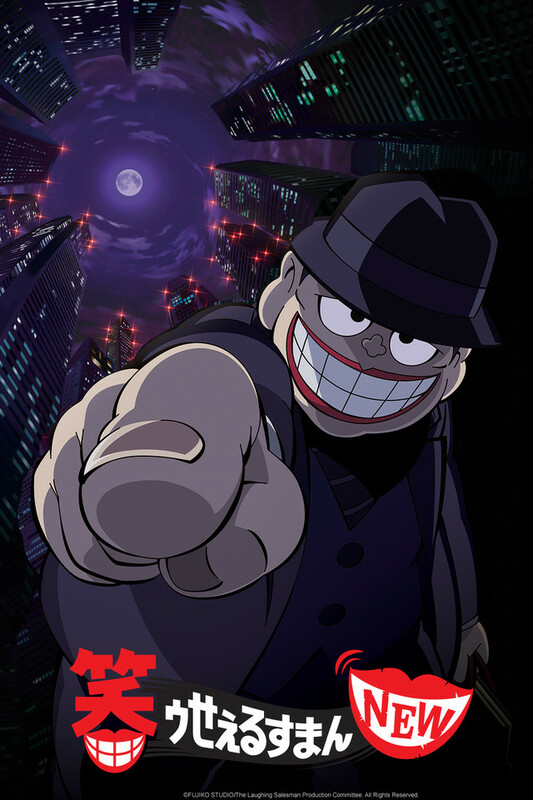 The Laughing Salesman is not for everyone, it's an original work, without many clichè and with no fanservice at all, to love this anime you really need to love animation and original stories. This show is something of a cross between Japanese Twilight Zone and tamer Needful Things. The core appeal of The Laughing Salesman is similar to looking at a train wreck. It's bad for all involved, but you can't help but stare. There is a depraved joy in watching how the train crashes! Though the animation is fairly simple, the art oozes style and detail. I especially enjoy how every scene that Mogura is in is framed! His creepiness and otherworldy nature come out spectacularly, especially in the Bar scenes. The intro and ending songs are really catchy, but the soundtrack is otherwise unintrusive. Mogura himself comes across as equal parts sinister and charming. In some episodes he is a clear threat, untrustworthy, looming and uncanny. In others, he builds up wonderful, intimate friendships with his clients, so much so that the inevitable downfall when the Client doesn't meet Mogura's expectations is heartbreaking. Whether that's a statement on humanity's inability to leave things alone or Mogura targeting those 'unworthy' kinds of people specifically is unclear. Make no mistake, there are no morals to these stories, despite what the main character claims. These are stories of a demonic salesman going around, ruining lives twice a episode. He is doing this for his own nefarious reasons. For flaws, well, don't expect a deep plotline, or any answers to who Mogura is or why he's doing it. Some of the Clients can feel like slightly different versions of previous Clients. Other Clients don't get enough development and come off as flat. The animation, while not distractedly bad, could certainly be better. The Laughing Salesman is a fun, colourful disasterpiece, most appealing to those with a hearty taste for schadenfreude, and even entertaining to those without. It's a great change from the sea of shonen anime fans find themselves immersed in these days. You only need to watch one or two episodes to get a feel for the rest of the series, and can safely drop it if you don't like what you see. I recommend everyone give it a chance! This is not your typical "deal with the devil". This is a demon making deals that seems so harmless with the typical person, typically causing chaos in the end for certain victim along with others around them involved. Some of the stories are a little silly, but there are a good amount of mind blown moments to be held. that and the music is badass!! He'll Give You What You Want & Will Ask for Nothing but You'll Still Be Left with the Bill! The Laughing Salesman revolves around Moguro Fukuzo, a salesman of human hearts. In a Mephistophelian manner, he will allow your deepest desires to come true. He won't be asking for payment and will caution you on what not to do but be warned, he has already set you up to fail! So as others have mentioned and I directly alluded to, this is a morality play that strongly works off of the ideas of Gothe's Faust. Moguro is a devilish character that others make a phenomenal deal with in an attempt to have their cravings come true but only to find that yearning sated in perverse, demeaning, or odd ways that leave them worse off than before. I have noticed that he'll always give an opportunity for a turn around and redemption but the hook has always already been taken. These dark, cautionary-style tales are not without humor, however. Occasionally the end even winds up being the punchline. The show is about a magic salesman gives people something they want only to twist it and screw them over in the end. You can gleam some lessons in life from each episode, but the show isn't aiming to be particularly deep and philosophical. It's just fun to see how creepy, smiley devil messes with people each week.